Pyramyd Airsoft Blog: Converting the WE M14 GBBR Magazine Capacity from 20 Rounds to 30 Rounds (with Photos) PS, you're welcome. Converting the WE M14 GBBR Magazine Capacity from 20 Rounds to 30 Rounds (with Photos) PS, you're welcome. 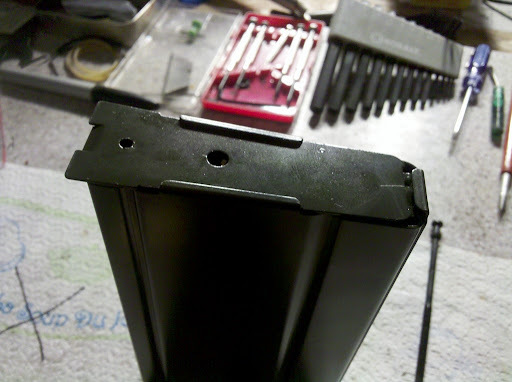 From the Bottom of the WE M14 gas magazine: Use something with a small tip to gently lift the notch over the magazine casing in order to slide the bottom plate off. Be careful here, you can bend the metal plate fairly easy. 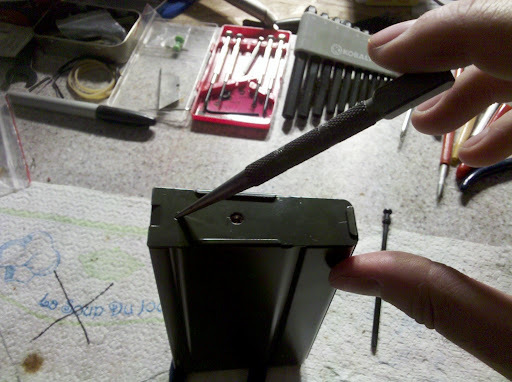 Very little force is needed to lift the notch over the case. You can see that I've slid the plate out just a smidge here. Notice the two side rails that run parallel to each other. The way the bottom plate is designed may cause you a bit of extra grief because the sides of said plate will catch on each of those two rails. You will need to do some wiggling of the plate side to side in order to slide it all the way out. Again, be careful about using too much force here, hulkster. Ignore the bolt on the left that I've crossed out in the photo below. That is another story for another day. For the time being, focus on the little bolt to the right, circled in red. 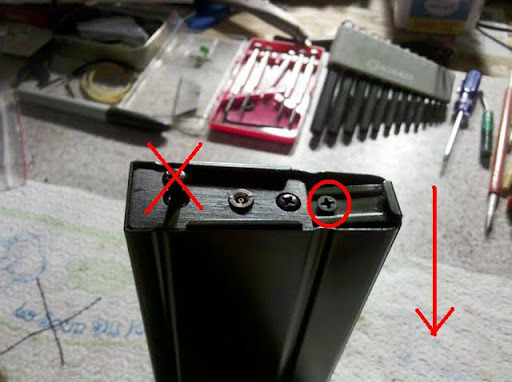 Unscrew it, then push the magazine's internals out the top of the external casing, in the direction of the red arrow on the right (remember, the magazine is pictured upside down). Once you've got the internal guts of the WE M14 GBBR's magazine out of the shell, this is sort of what you'll see. 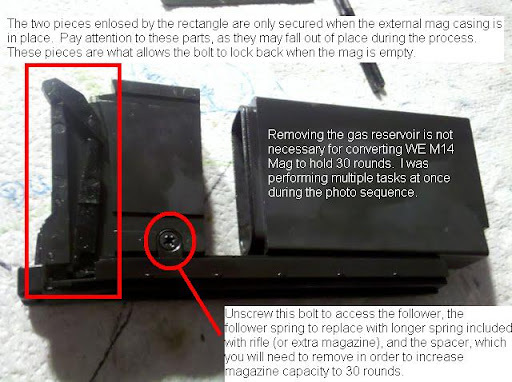 What by this point in the photo sequence, I had removed the two long bolts that secure the gas reservoir to the rest of the magazine. You can see in the image below that I've made some notes. Feel free to read them and mention any questions in the comment section of the blog, should my comments create any confusion and/or curiosity. Look here!!! Ok, now look below at the photo I've provide you with. 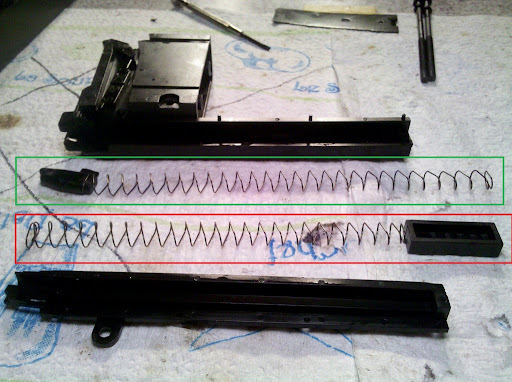 It's no coincidence that I've placed color-coded rectangles around each of the two springs. The green rectangle indicates that you should use the longer spring that comes with the rifle, and likely the extra mags, too. The red rectangle encloses the original follower spring, and the notorious spacer (also rectangular). Green means go and red means stop (at last here in certain parts of California), so therefore, use the longer spring. It works. From here, all you do is put the thing back together again. Boom!!! You now have a 30-round WE M14 gas magazine. Congratulations. Now go shoot some tangos (but only if you're at an Airsoft field where you're legally allowed to play, and your target is wearing ANSI-rated eye protection). It's unfortunate that I have to add that in there to cover my a$$ but it's the world we live in. Yay! Do you Airsoft and tell?